As the summer season wanes, September in Santa Fe is busy with events. Santa Fe, America's Oldest Capital City, is having its 400th Anniversary and the celebration starts September 5. The 400th Anniversary kick-off event will launch the 16 month Commemoration on Labor Day weekend. Taking place on September 5th and 6th at Fort Marcy Park, ¡VIVA! Santa Fe is a FREE cultural festival on Magers Field. More information here. The cry of "Viva la Fiesta" has been reverberating through the streets of Old Santa Fe every autumn for 297 years. The sound generates a curious blend of thanksgiving, revelry and pride in the hearts of Santa Feans who celebrate Fiesta annually to commemorate Don Diego De Vargas' reoccupation of the City of Holy Faith in 1692. Fiesta weekend starts with the annual burning of "old man gloom", Zozobra, on September 10. These are only a couple of the numerous events scheduled through September, check the calender here for a full list. 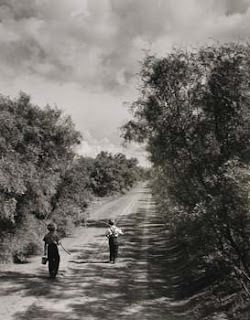 September is also your last chance to see the Gallery's exhibit, "A Thousand Words: Masters of Photojournalism". Gathered together for the first time are 60 examples of the greatest photographs from the field of photojournalism. We have often seen these photographs reproduced numerous times in newspapers, magazines, books and documentaries. Universally relevant, they reflect the past, the present, and the changing times. These unforgettable images are embedded in our collective consciousness; they are defining moments chronicling our visual history. They are, indeed, worth a thousand words. Behind the scenes we are hard at work preparing for the Stephen Wilkes' retrospective exhibition, opening October 2. Stephen Wilkes will be here for the opening, and present a very special gallery talk from 5-6 PM. Featured in the exhibition are large-format photographs from several of Wilkes' major projects, including: America in Detail, Bethlehem Steel, In Katrina's Wake, Ellis Island, China; and a selection of new photographs. The New York Times had an interesting article this weekend on "faked photographs". A slide show accompanies the article. Two photographs featured in the gallery's current exhibition "A Thousand Words: Masters of Photojournalism" are discussed in the article, not as "fakes" but as misunderstood and altered examples. One of the photographs singled out is Joe Rosenthal's iconic flag raining at Iwo Jima. 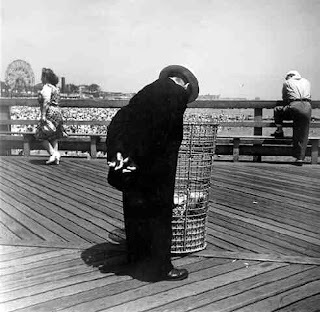 We were especially pleased that the New York Times discussed this long-misunderstood photograph. Whenever it is displayed in the gallery we always overhear visitors speaking about their own version or interpretation of the photograph, almost always wrong. "Questions dogged Joe Rosenthal’s Pulitzer Prize-winning shot of Marines raising the flag at Iwo Jima from the start — the result of a conversation overheard and misunderstood", according to Hal Buell, who wrote a book about the image. 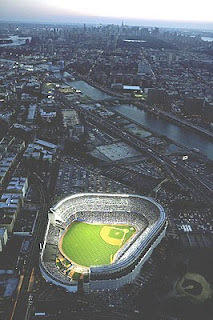 The photo was a sensation when it appeared in newspapers in the States. Back on the war front, someone asked Mr. Rosenthal if his picture had been staged. The photographer, who did not know which frame had been published, said yes — referring to a different picture of those same Marines whooping it up for the camera at Mr. Rosenthal’s request. Time magazine prepared an article about the alleged set-up that was never published, but details leaked out and went viral in the manner of the day. 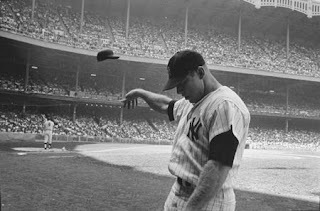 Mr. Buell, the retired head of the Associated Press photo service, says that despite film of the whole event proving the authenticity of Mr. Rosenthal’s work, a whiff of controversy stubbornly lives on." "One famous photo has been subject to a mundane form of fakery that it can’t seem to shake, years later. The photographer John Paul Filo caught the death of a Kent State student and the anguished reaction it provoked in a young bystander, and won the Pulitzer Prize for it. But the editors of Life magazine saw room for improvement, removing a post from behind the bystander’s head to tidy things up a bit. The altered image has been published and republished, Mr. Filo lamented, despite his protests. “The picture keeps on living and working,” he said." In light of the current exhibit, it is interesting to note how so many famous photographs have inspired stories that are mis-informed. To this day, people often dismiss Alfred Eisenstaedt's photograph from VJ-Day in Times Square as "staged" (it wasn't, Eisenstaed tirelessly would recount the circumstances of the photograph each time someone questioned it). And also to this day, numerous people claim the be, variously, the sailor or the nurse. 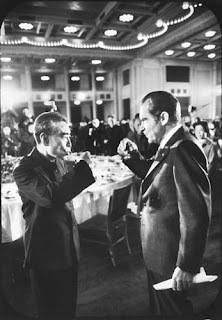 "I thought MacArthur was the most brilliant man I had ever known. I had good moments with him and bad moments. I rejoined MacArthur in Leyete, and was the only photographer to accompany him on his command ship the USS Boise for the invasion of Luzon. And I was invited to go ashore with him. As our landing craft neared the beach I saw that the SeaBees has laid a pontoon walkway out from the beach. I climbed the boat’s ramp and jumped onto the pontoons to photograph MacArthur. But in the instant of my jumping, I heard the boat’s engines reversing, and I saw the boat swinging away. Judging from what was happening, I raced to the beach and stood waiting for the boat to come to me. It dropped its ramp in knee-deep water and I photographed MacArthur coming ashore. No one I have ever known in public life had a better understanding of the drama and power of a picture”. Over more than 25 years as photography dealers, we have noticed an increase in people's perception that, somehow, photographs must be "staged" or "altered". Perhaps with the spread of Photoshop and other digital technologies, we now must question what is "real". We believe there are certain mysteries about great photographs that captivate viewers and cause us to pause in thought and remembrance. We have often seen these photographs reproduced numerous times in newspapers, magazines, books and documentaries. Yet these unforgettable images are embedded in our collective consciousness; they are defining moments chronicling our visual history. As summer's end nears, we thought about a few of our favorite photographs of summer. Enjoy these last days, hope you had a great summer. And remember to see the exhibit "A Thousand Words: Masters of Photojournalism", on view through September 27 at Monroe Gallery. For a few days in August, 1969, on a dairy farm in upstate New York, a half-million young people got together to hang out, dance, and listen to music. Forty years later, for many people, the Woodstock Music & Art Fair is the defining event of the Sixties. For LIFE photographer John Dominis, covering the festival became one of the most moving adventures of an amazing 25-year career. "I was much more interested in the people who were there than the musicians," he tells LIFE.com. "I liked the music okay, but I really liked the kids, and what they were doing, and how they felt about it all. I just wanted to capture that." Here, Dominis' favorite photographs from Woodstock. And here, he talks with CNN about the experience. "We didn't know that it was going to be a huge event," Dominis remembers, "but I did take with me a wide angle camera for shooting big crowds, just in case. I put that in my kit, and of course I had the chance to use that camera a bit over the course of the three days I was there." To purchase a signed print of this photograph, or other classic John Dominis images, visit the Monroe Gallery of Photography online. Another renowned LIFE photographer, Bill Eppridge was also at Woodstock. His photographs were recently featured in the New York Times. The New York Times' excellent photo-blog Lens is featuring a slide show of Bill Eppridge's photographs from Woodstock, along with audio of Bill's recollections. Bill Eppridge is one of the most significant photojournalists of our time, for over four decades he has covered a remarkable assortment of stories for renowned national publications such as National Geographic, LIFE magazine and Sports Illustrated. His collective assignments read like a list of the most important historical and cultural events from the latter half of the 20th Century. Eppridge recorded the Beatles’ first momentous visit to the United States. He photographed a young Barbra Streisand—living in a tiny railroad apartment in Manhattan—on the verge of super stardom. He was the only photographer admitted into Marilyn Lovell’s home as her husband, Jim, made his nail-biting re-entry into the atmosphere in the crippled Apollo 13 spacecraft. He captured Clint Eastwood on the set of Dirty Harry. He was at Woodstock. And he was in Vietnam. He covered the funeral of civil rights activist James Chaney in Mississippi. His landmark photographic essay on Needle Park heroin addiction won the National Headliner Award and inspired the motion picture Panic in Needle Park, starring Al Pacino. That photo essay is included in Things As They Are: Photojournalism in Context Since 1955, the 2005 ICP award-winning book by World Press Photo. 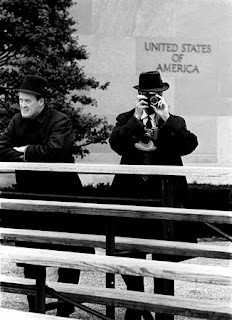 Eppridge spent much of 1966 and 1968 on the road with Robert F. Kennedy, covering the presidential campaign for LIFE magazine. It was Eppridge who took one of the decade’s most poignant and iconic photographs: a stunned Los Angeles busboy, Juan Romero, cradling the candidate in the kitchen of the Ambassador Hotel, just seconds after he was shot. 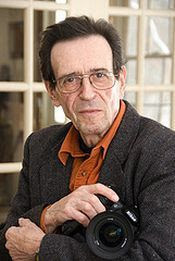 Throughout his career Eppridge has been a respected force in training a new generation of photojournalists at the University of Missouri Photojournalism Workshop, as well as at the Eddie Adams Photography Workshop, and Photography at the Summit, in Wyoming. His work has been exhibited at the Smithsonian Museum of American History, the Museum of Television and Radio, the High Museum of Art in Atlanta, the Visa Pour L’Image in Perpignon, France and throughout the U.S. and Europe. A comprehensive exhibit of his photographs of the Beatles are currently on a worldwide tour, and, in the spring of 2008, went on exhibit in the Beatles’ hometown of Liverpool. 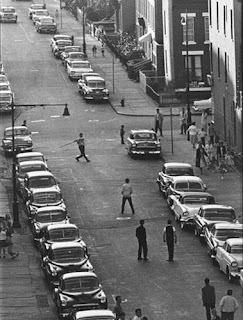 Monroe Gallery of Photography is honored to represent the photography of Bill Eppridge and John Dominis. Several of their photographs are featured in the current exhibition, "A Thousand Words: Masters of Photojournalism", on view through September 27. 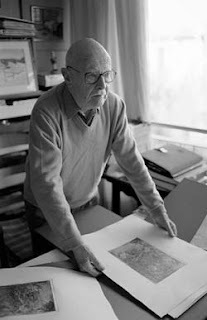 We wish Lucien Clergue and Willy Ronis Happy Birthdays and congratulations on milestones - Clergue turns 75 and Ronis 99 - on August 14. Lucien Clergue is a fine arts photographer, author, lecturer, educator, and filmmaker. He has enjoyed world-wide success with exhibitions across five continents. 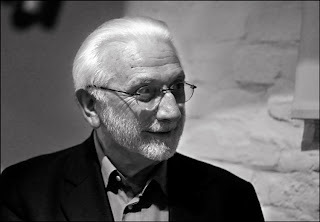 In 2003, Clergue was appointed a Chevalier of the French Legion of Honor for his work in the field of photography, and in 2005 he was the Lucie Award recipient for the Lifetime Achievement in Fine Art. In 2007, he was elected into the Academie des Beaux-Arts. Willy Ronis was born in Paris in 1910, the son of Jewish immigrants from Russia and Lithuania. As a young boy, he worked with his father in the family portrait studio and studied piano. 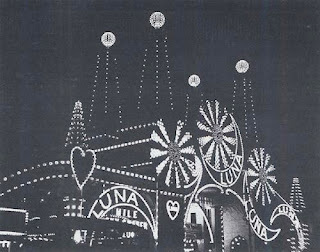 His love of music as well as his early photography work developed Ronis' sense of composition. 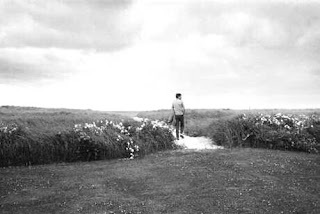 He followed his passions into a career in photojournalism, and, as a result, Ronis became part of the great Parisian group of documentary photographers that also included Henri Cartier-Bresson and Robert Doisneau. 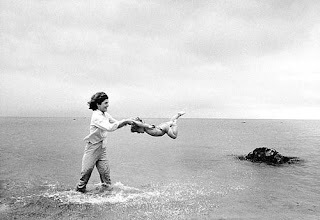 The images created by Willis Ronis capture the simple pleasures of everyday life. Not one to focus on suffering, his' photographs are often light-hearted, humor-filled, and full of compassion even as they capture the delight of French "joie de vivre." As one of the great masters of twentieth century photography his work is in the collections of major museums and private collectors around the world. His work is being celebrated at the 4oth annual Les Rencontres d'Arles festival. 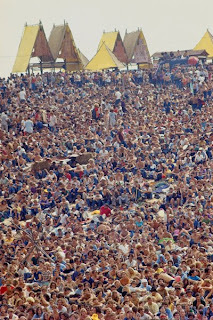 Life.com has just posted an on-line slide show of Woodstock photographs by John Dominis. For a few days in August, 1969, on a dairy farm in upstate New York, a half-million young people got together to hang out, dance, and listen to music. Forty years later, for many people, the Woodstock Music & Art Fair is the defining event of the Sixties. For LIFE photographer John Dominis, covering the festival became one of the most moving adventures of an amazing 25-year career. "I was much more interested in the people who were there than the musicians," he tells LIFE.com. "I liked the music okay, but I really liked the kids, and what they were doing, and how they felt about it all. I just wanted to capture that." 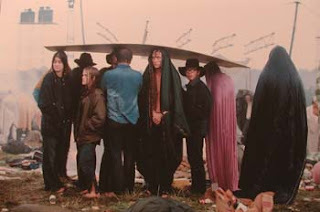 Here, Dominis' favorite photographs from Woodstock. It was 35 years ago this weekend that President Richard M. Nixon resigned, ending a bitter and turbulent presidency. It is interesting to re-visit the newspapers of the day, and hear his resignation speech. 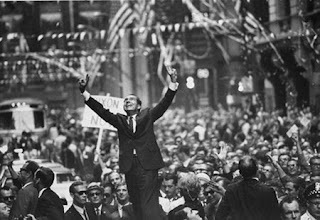 As we remember the 40th anniversaries this summer of Apollo 11 and Woodstock, we took a look into the Monroe Gallery archives for a selection of Nixon photographs. 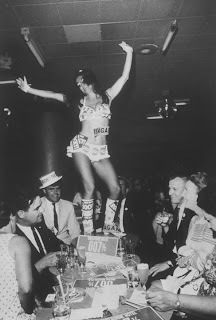 Republican delegation from New Hampshire meet in Shelbourne Hotel's 007 1/2 GoGo Room, where politically attired Go-Go girl dances atop table, 1968 Lynn Pelham ©Time Inc.
July was an extremely busy month in Santa Fe, with dozens of events and activities. August promises to be another active month, with many great events happening. The current exhibition "A Thousand Words: Masters of Photojournalism" continues. The exhibit is one of the most-talked about exhibits of the year, and has already drawn tremendous acclaim. Monroe Gallery is also featuring a special online exhibition of photographs from 1969. The commemorations for the 40th anniversary of Woodstock have started, last week the New York Times featured the photographs and memories of Bill Eppridge. However, now the New York Times is reporting: "Peace, love, understanding and nostalgia do not seem to be quite enough to resurrect a 40th anniversary version of Woodstock. Michael Lang, one of the event’s original promoters told Rolling Stone magazine that he has dropped plans to put together a third anniversary concert – after ones in 1994 and 1999." Other highlights in August: The Santa Fe Opera, the Mountain Man rendezvous, Whitehawk antique show, Indian Market (August 22 and 23), and more. NEW YORK Six prominent media professionals and an online news outlet will receive the Missouri Honor Medal for Distinguished Service in Journalism from the University of Missouri School of Journalism, the school announced Tuesday. The 2009 medalists will be honored on Tuesday, Oct. 20, on the University of Missouri campus. They include: Mazhar Abbas, a press freedom advocate in Pakistan; Rance Crain, president of Crain Communications Inc.; Doug Crews, executive director, Missouri Press Association; Photojournalist Bill Eppridge; Rod Gelatt, professor emeritus, Missouri School of Journalism; Deborah Howell, former Washington Post ombudsman and veteran Washington journalist; and Slate, a daily online magazine. The medalists also will present classes to Missouri School of Journalism students and other guests during Oct. 20. That evening, they will be recognized at an awards banquet at the Donald W. Reynolds Alumni Center on the MU campus. The medalists are selected by the faculty "on the basis of lifetime or superior achievement in journalism," a release stated. Note: see previous post about Bill Eppridge's photographs and memories from Woodstock and the 1960's.